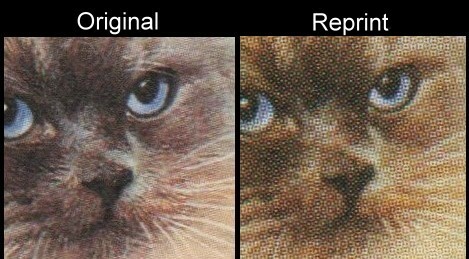 I have discovered that there is a reprinted version of the 1985 Cats issue that is very different from the original versions. Before showing these I wish to assure all who read this that the reprinting was done under legal grounds. After some read this they may start calling them fakes or forgeries. In essence they are simply unauthorized reprints made by a stamp dealer named Clive Feigenbaum. I can tell you that real dangerous forgeries are being flooded on the market as I rewrite this page in November of 2016. Please visit the "Modern Fake Stamps" section to learn how to define them. Unlike the Saint vincent Elvis and Michael Jackson unauthorized secondary reprints at this time there is no evidence that these reprints are "secondary". They were reprinted after Format closed the doors but at present there is no evidence that the Format Printers ever reprinted the set. Therefore, very few original proofs, progressive color proof sets, etc; exist. The majority come from this reprinting. In my searches for evidence on the internet on the above mentioned forgeries of this issue I came across several sellers offering imperforate sets of this issue. To my surprise several had imaged a set with the positive proof that the Format International Security Printers never made the reprints. Here are the images. The proof is the color guide on the 50c value. This same color guide is found on the St. Vincent 1985 Michael Jackson and Elvis Presley unauthorized reprints. The color guides used on the genuine stamp issues do not look like this guide at all therefore proving the reprints were never done at Format. It is unknown at this time when these unauthorized reprint stamps first appeared. We can presume that because they have a similarity to the unauthorized reprints of the Saint Vincent Michael Jackson and Elvis Presley stamp sets that they probably came onto the market in the same timeframe. Clive Feigenbaum had access to the original artwork transparencies and printing plates separations and for this set the original plates so the unauthorized reprints are of fair quality. 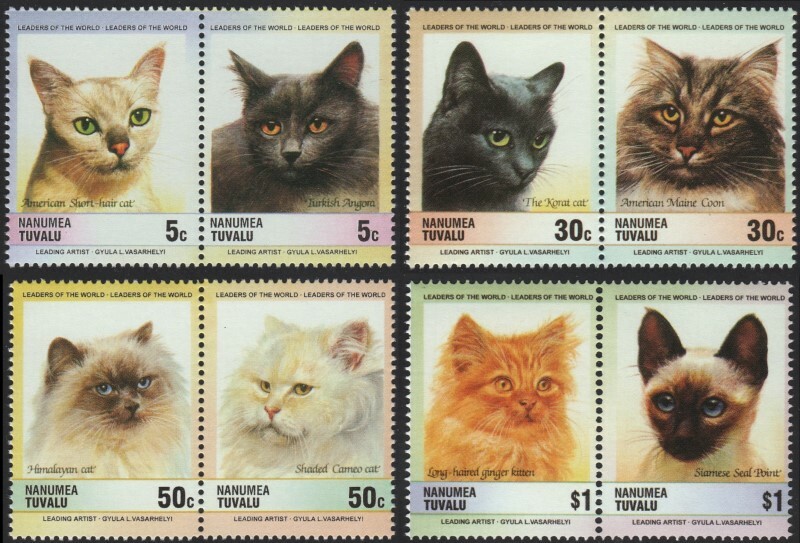 The stamps are more than capable of not being detected by all dealers, stamp collectors and Cat Topical collectors. 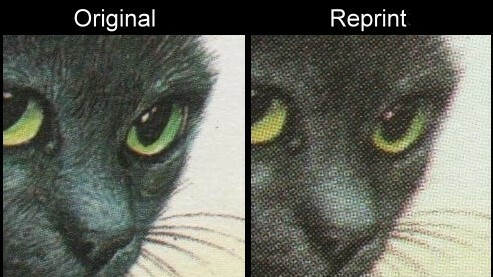 There are however, a number of distinguishing features on the unauthorized reprints (that are illustrated below), which make them easy to identify from the original stamps. 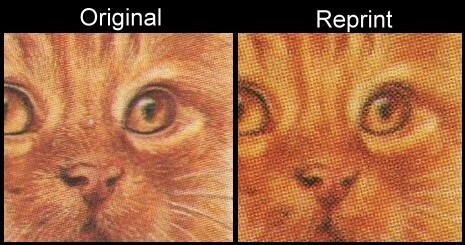 I would value the unauthorized reprints at nothing. This is true "wallpaper". At the time of this webpage creation approximately 50% of sales on the market contain the reprints. Others may try to disagree but as time will tell it will be according to what the market decides....not the sellers nor "experts" as obviously there are none or this would have been known long ago. Noting on this value that the original frame color is a much more intense pinkish color than on the unauthorized reprint. Here again on the $1 values we have similar differences. 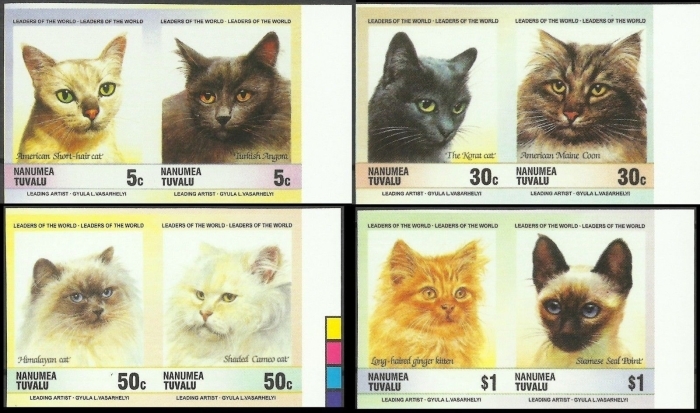 This sums up the demonstration on how to identify the unauthorized reprints of the Tuvalu Nanumea 1985 Cats stamps. As you can see, you do not have to be an expert philatelist to be able to do this. You do not even have to be a collector at all! The differences between the original stamps and the unauthorized reprints is quite obvious. 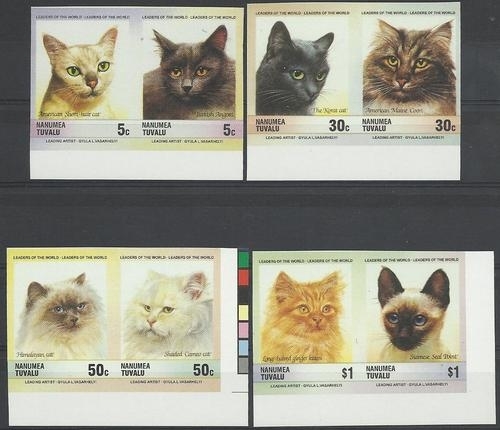 I hope that this reference page on the Tuvalu Nanumea 1985 Cats unauthorized reprint stamps will assist all collectors, dealers and memorabilia collectors in defining and chosing which sets they have or are buying.